After experiencing a high note, Doctor Freust gets the wind knocked out of her sails as inmate eleven discloses she’s unleashed a threat insane the building. With a murderer on the loose, it’s going to get rough in a hurry. Good fortune only lasts so long in that place. 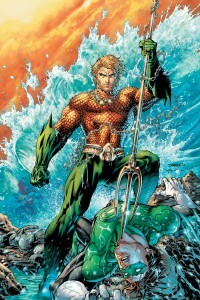 Issue 4 heads right into the mess and takes little time to unveil the latest star of the issue. 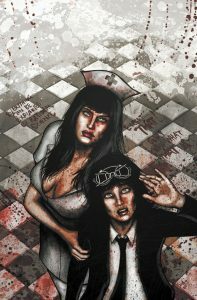 While shaken, Doctor Freust still has her wits and confidence going on and faces off with an inmate atop the building. It’s an interesting exchange with a sign that our Doctor is leaving bits of her reluctance behind and instead embracing the madness her father pioneered. Unfortunately, chaos was still alive and well throughout the facility leaving Doctor Freust to navigate the maze inmate eleven was working on. Seeing inmate eleven resume the mind f… un with the Doctor is a strange series of encounters, we learn that anything Doctor Freust thought she figured out about eleven is completely wrong. 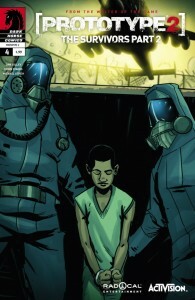 While some inmates are easily decoded and sedated, eleven is completely on another level and that message is delivered with shocking clarity and so little mercy to Freust and the readers as well. The art throughout issue 4 is on par with the series so far, conveying emotion through gestures, body position and other accents. Readers learn new workings of the building and the landscape surrounding it. While it feels confined, it’s actually a wider experience of what the world in Malefic has to offer, at least within that limited landscape. I take my hat off to Dan Schaffer and David Miller, that closing section genuinely had me take a long pause. 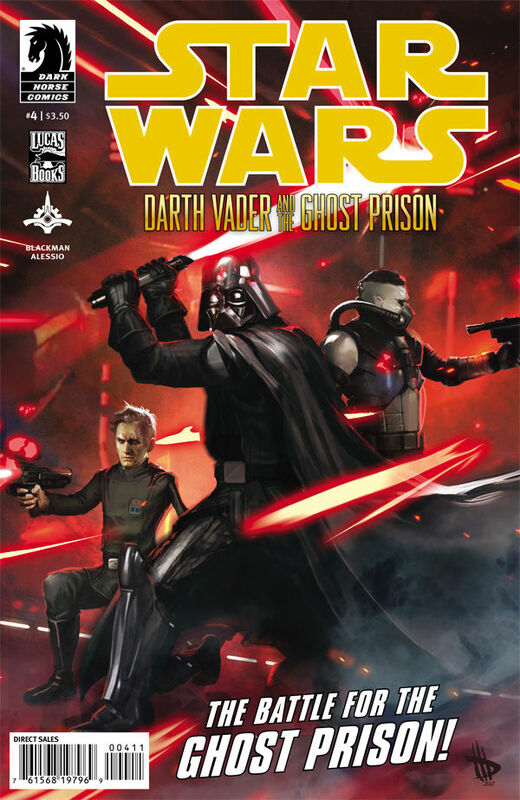 We haven’t covered the Ghost Prison on Bamfas yet, but it is in contention for being one of the better Star Wars releases of the year, taking a traditional approach in art, story and focusing on Vader puts it in our top considerations for the year. 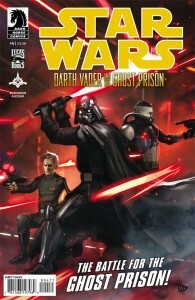 We join up in issue 4 with Vader on the Prism in the midst of all out chaos. Rioters battling away not only for a chance to live but for their pursuit of power, it is a demonstration of complete violence and Vader stands at the top of the pile, putting down anyone who dares oppose him. While Gentis prepares himself to take his spot as head of the Empire we see that Vader, Trachta and Tohm are getting ready to move after their arena challenge reaches completion and the winners board up. New faces come into the story and while that seems like a given after a mass recruitment it’s only a strong 2 that really make impressions not only on Vader and the crew but on the reader as well. Not only does the payback for the attack on the Emperor seem to be well on the way but it could prove to be a mass obliteration of those in Vader’s path. Personally I enjoy that most of this has been a character exploration just as much as it has been about action and the unknown. Haden Blackman paints unique narratives that give a sense of danger and struggle, and also these same narratives show how unwavering Vader is at all times as an absolute power. His view on recruitment and personal slaying of anyone who dares step into his arena are signs of how intense he really is especially with the Emperor in recovery. Agustin Alessio compliments the issue with illustrative work that shines through, while some issues in the series go for a painting impression, we don’t see that. Each panel is incredibly detailed and bold in line usage, expressions run wild and gestures help tell the story that words cannot. 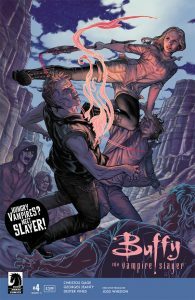 Seeing survivors torn apart and barely holding together trying to plea for mercy, it gets in-depth for emotion to say the least and the duo manage to drive the story while feeding off each others creative energy. Issue 5 is just around the corner, those who haven’t caught this series should really give it a shot, I can say it’s well worth the investment if you want some classic Star Wars drama and Vader showing his cold iron fist. The final installment of the Homeworlds series is here, we jump in with Liara T’soni before the Mass Effect 3 storyline kicks off. Functioning as the Shadow Broker she seeks every shred of information possible to stand a chance against the Reapers. It has become an impossible task for her to find the information that she needs but her persistence and connections are what carry her onward to find even the slightest glimmer of hope. 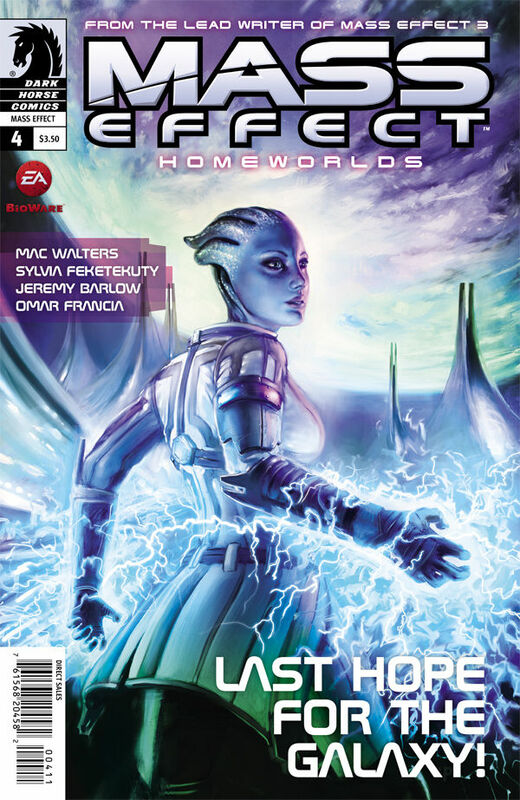 In Homeworlds #4 we see Liara pushing the limits of her relationships, associations and more and it’s finally wearing on her. We get a sense of her mental fatigue processing so much endless data, we see the juggled commitments and those she’s personally tied to expressing their concern of where this is all going. Although one has to admit, if the entire universe was on the brink of annihilation this wouldn’t be all that surprising or unexpected to come across, it’s just the gravity of the situation hasn’t come crashing down yet. 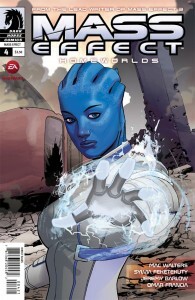 With desperation growing, Liara goes from authority to fresh game, Cerberus may be partnered up with her but it doesn’t take much to signal them to put a knife in her back if an opportunity presents itself. Their own personal quest for information has clashed with her with the Reapers going into higher activity. It’s an interesting exchange and Liara continues to use the knowledge and skills that got her where she is to show who the force is in this deal. For her, burning a few bridges is nothing if it means saving the universe from ceasing to exist, she just gets even tougher and heads forward even stronger than before. We leave with her story going straight into Mass Effect 3 and conclude this arc of Homeworlds stories. 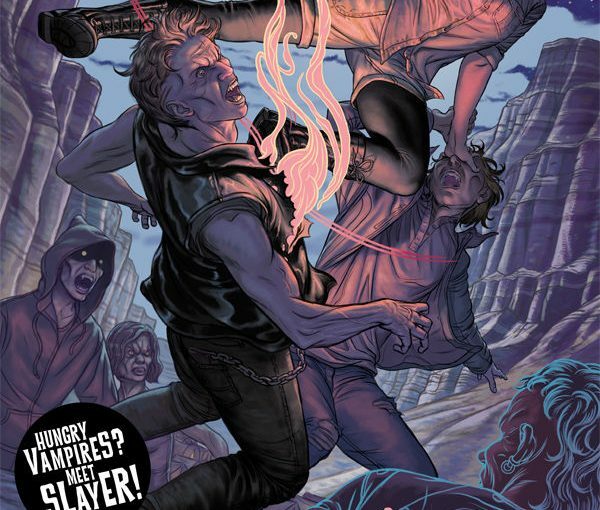 Prototype 2 The Survivors Part 1 left us with an odd taste, jumping into a completely new story and another set of dilemmas to navigate through in the pages of the book. The survival group goes on a fast paced journey from isolation and self-preservation into full action trying to spring themselves loose from the heavily contaminated Red Zone of the city, given some bad luck they end up crashing short of their promised land and wind up in the Yellow Zone. Part 2 picks up right after this, we see a darker truth to improvements of the Yellow Zone, yes people are alive but they’re still surrounded with mutants and there’s a bad air about the situation as a whole with what Blackwatch is really doing for this entire situation. The group bands together again on a final journey, the escape to the Green Zone where they can break free once again, unfortunately luck in the Prototype Universe is clearly not on their side. The situation feels lighter than ever as they execute on their plan, soaring above the patch of freedom below, soon to be their home thanks to persistence and drive. Well, almost. Fate has a different plan in mind and Conrad didn’t even see it coming, we’re left to wait for the game to come out or possibly this next set of installments to help clear up all these loose ends and get some closure. The art is a slight improvement for The Survivors Part 2, shape shifting isn’t nearly as common although the fish eyes still tend to pop up with Conrad making for some odd moments. Overall it was a style shift and it has to be accounted for, it’s more an issue that across a series there is some level of continued style expected as well. Design did improve and color delivered the drama with moments like Conrad resigning himself for the good of those who he wished to protect the most. As a whole though it’s getting tough to live with all these cliffhanger sections, we see a sweeping rush of conflict and hope and then complete hole to be filled by the game or another installment. If you’re following the digital releases be sure to get your issues in pairs or the series will not make much sense, one can only guess what the final arc will bring before the release of the game.